I saw Tweets about Nutella Day and of course got to thinking about what I could contribute. Margot and I love the stuff and when I found it was made by the same company that makes the Ferro Rocher candies that I have been addicted to from time to time, it totally made sense. I went with something that I don’t do a lot in my blog, baking. 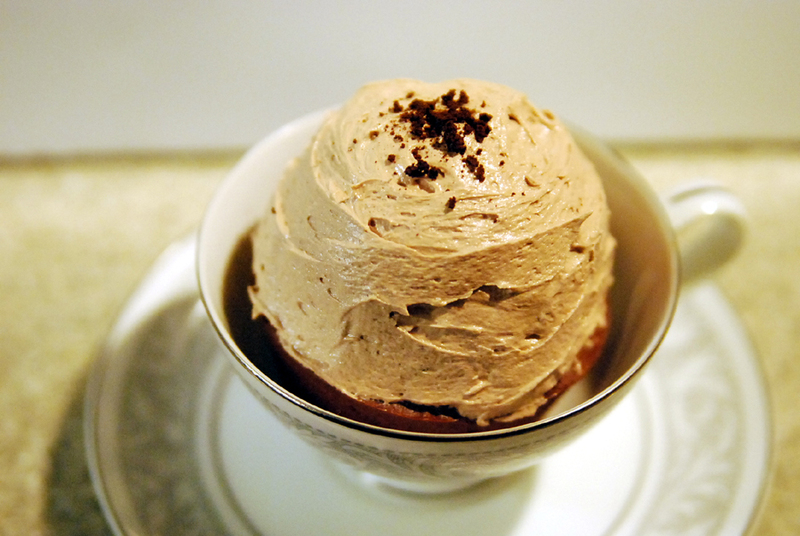 I made cappuccino muffins, cupcakes seem apt as a description too, with Nutella and marshmallow fluff frosting. The frosting was Margot’s idea. She’s got a better feel for sweet treats than I do and ignoring that idea would be pretty stupid in my experience. Set oven to 375. Combine dry (first 6 ingredients) in a large mixing bowl. Mix the instant coffee into the almond milk. Mix in the melted Smart Balance, beaten egg and vanilla to the milk. Mix the wet ingredients into the dry until well blended. 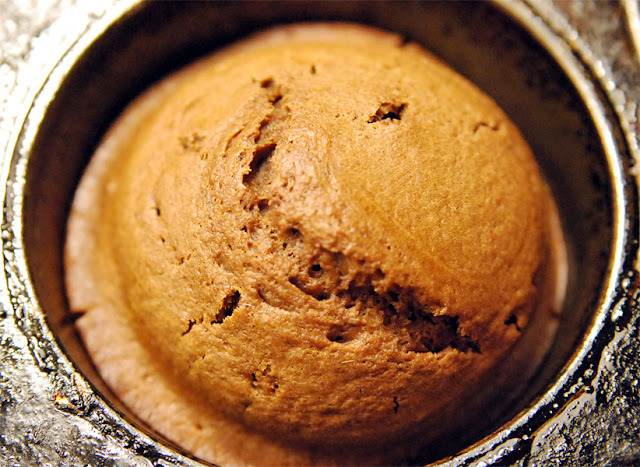 Pour batter into 6 greased or paper lined large muffin tins. Bake for 17-20 minutes or until a knife inserted in to the center comes out clean. Allow to cool. 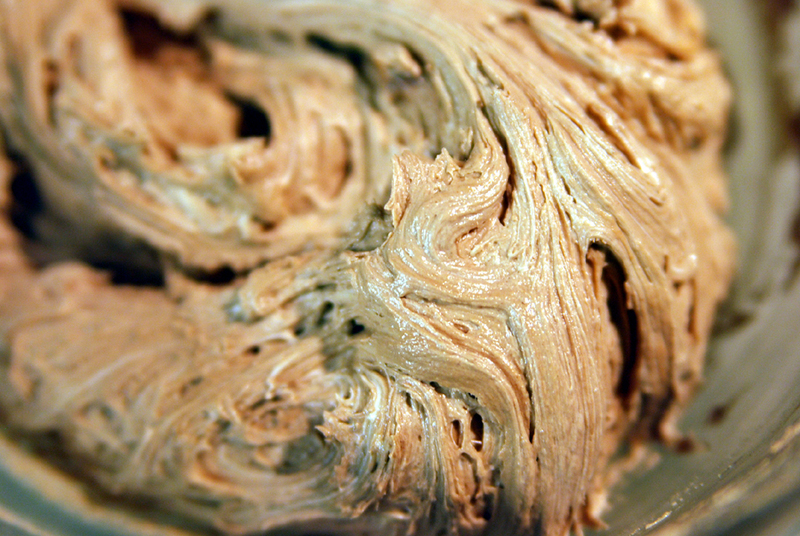 Blend the softened butter and Nutella together until smooth. Mix in the sugar and vanilla. Gently fold in the fluff using a spatula. Spread over the cool cupcakes. The presentation in the china coffee cup completes the idea that this would be a great pairing with a hot cup of coffee for breakfast or an afternoon snack! I hope everyone is having fun on Nutella Day. The list of recipes compiled so far is pretty amazing. Thank you for posting a recipe! Happy Nutella day! Congrats on going out of your comfort zone - and what better reason that Nutella Day? I think these flavors would work very well! Holy sh**. I'm skipping the muffins and going straight for the frosting. Oh my goodness gracious - wow!! Amazing treat...thank you for sharing! Yummy, yummy, What a delicious recipe. This muffin looks delicious. Thank you for sharing!! These were so much fun to make and it got me thinking about baking more. I used to when I was younger. They were damn good too! This looks fantastic, but on my computer, the FB and Twitter share buttons cover the proportions on the first 4 ingredients. Could you please let me know? I'd love to make some! Sorry, is that a 1/2 cup and 2 tbsp of almond milk? Just wanted to clarify. Just fixed the recipe. Thanks! Do We Need an Excuse To Drink Red Wine? The Discovery Channel Loves Beer! Gimme Some Pie! Some Portland Pizza Pie! Apple Pie - To Compete Or Not?